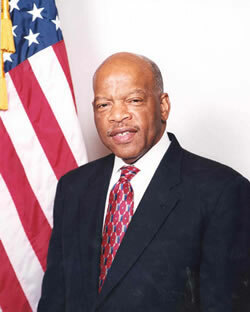 John Robert Lewis, born February 21, 1940 (age 79) in Troy, Alabama, is a liberal Democratic Congressman from Georgia's 5th congressional district in the U.S. House of Representatives. Lewis gained national fame as a leader of the Civil Rights Movement in the 1960s, playing prominent roles in the 1965 Selma to Montgomery marches and community organizations. First elected to the house in 1986, his district covers most of Atlanta. He is the second African American to represent Georgia in Congress since Reconstruction. Since his district is heavily Democratic, he has faced no significant opposition in over 20 years in Congress. In the Bush years he was a strong critic of the War in Iraq and called for the impeachment of President George W. Bush. Lewis sparked controversy in the 2008 presidential election when he compared Republican candidate John McCain to 1960s segregationist George Wallace. "During another period, in the not too distant past, there was a governor of the state of Alabama named George Wallace who also became a presidential candidate. George Wallace never threw a bomb. He never fired a gun, but he created the climate and the conditions that encouraged vicious attacks against innocent Americans who were simply trying to exercise their constitutional rights. Because of this atmosphere of hate, four little girls were killed on Sunday morning when a church was bombed in Birmingham, Alabama." McCain responded by saying, "The notion that legitimate criticism of Senator Obama's record and positions could be compared to Governor George Wallace, his segregationist policies and the violence he provoked is unacceptable and has no place in this campaign." This page was last modified on 16 February 2019, at 13:51.